Bringing telescopes and volunteers to help run star-gazing nights to secondary schools across Victoria through the Telescopes in Schools program. We also provide training for teachers involved in the program. Embedding a dozen year 10 students within the group for a week-long work experience each winter. You can learn more and apply for the program here. Through our new “Ask an Astronomer” program. Have a question about planets around other stars? How the Universe began? Get an expert to answer! By supporting astronomy-themed events throughout Melbourne. Upcoming events will be listed here. Through the School of Physics outreach activities. 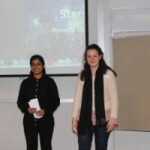 Astronomy and astrophysics make frequent appearances in the School’s public lecture series. The School’s events page lists upcoming events, as well as hosting videos of past lectures. Post-presentation snapshot. The work experience week ends with presentations by the students. Ultimately, our hope is to spark the curiosity of the next generation of scientists and astronomers, while encouraging interest in the Universe around us in individuals of all ages.